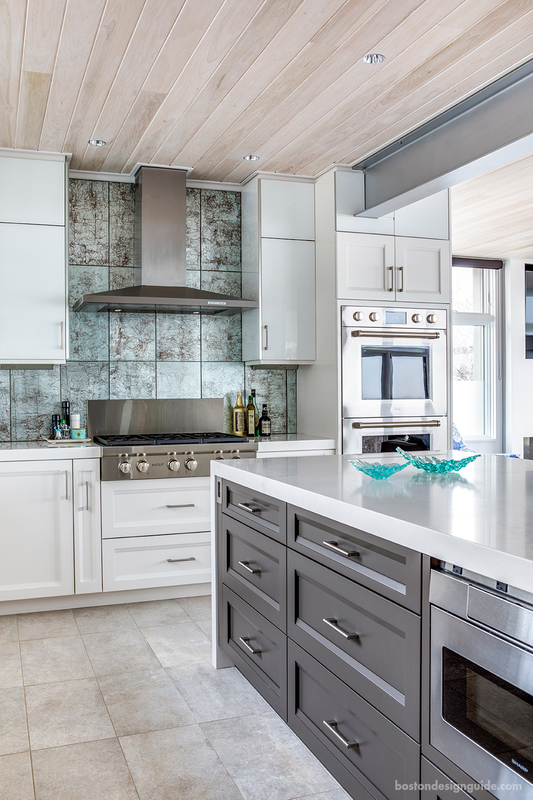 Within a seaside enclave lined with hydrangea and traditional beach cottages clad in cedar shingles turned silver-gray by salt air and the passage of time, a contemporary beach house has emerged. 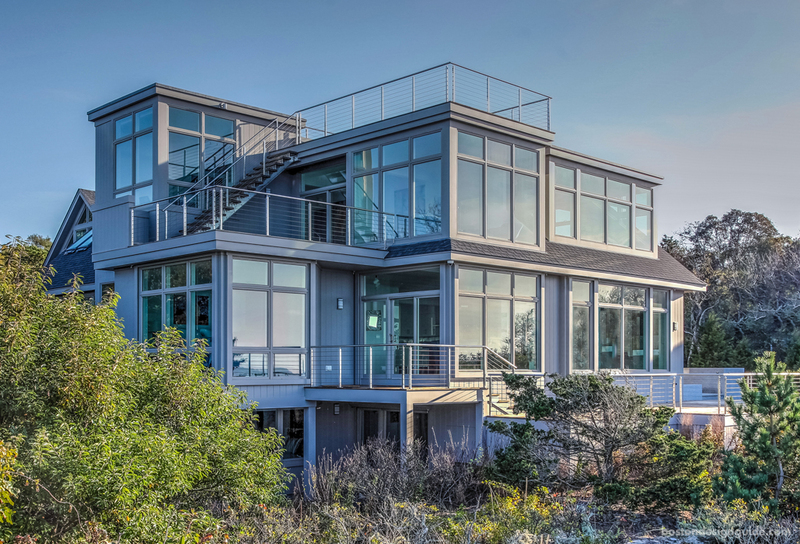 The retreat, designed and built by Architectural Design, Inc. (AD), sits atop a coastal dune overlooking the famous Brewster flats, where it has a front-row seat to dramatic shifts in the shoreline of Cape Cod Bay. The tidal patterns of this remarkable locale bring cool blue depths or walkable, mile-long sandbars that seem to stretch to the horizon, depending on the hour. It’s a spectacular and ever-changing setting. This house was designed to drink it all in. With its profusion of glass, sleek lines, impeccable finishes and trimless detail throughout the interior architecture, the second home is unequivocally sophisticated. Yet it is also exuberant, with a joyful air no doubt instilled by owners Bill and Kim Kerlin. The property is actively enjoyed indoors and out. 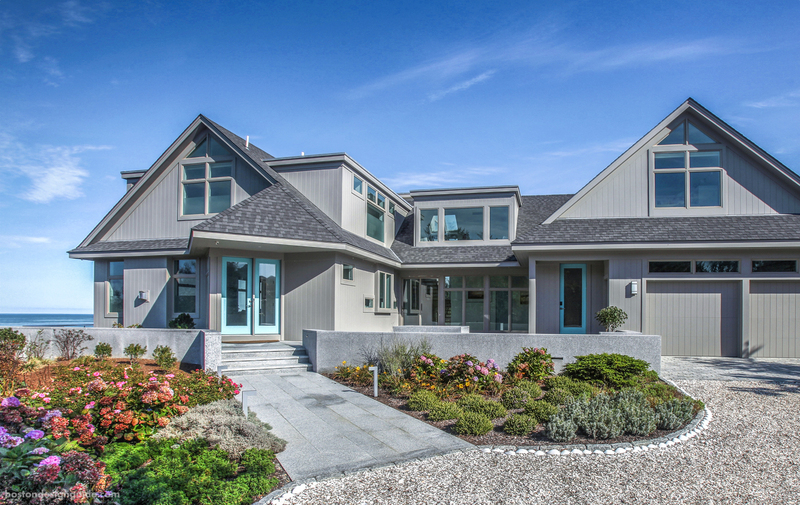 The Kerlins scour the sand for sea glass, have a “special spot” for collecting clamshells (which then line their drive), garden, cook and host yearly girls’ weekends. The home is chic, but lively, with decks at every level that bask in the views and the path of the sun. Shades of peacock, cobalt, aqua and Florida pink infuse the paint and furnishings of each room, while the walls are kept gallery-white to frame an art collection bursting with color and, sometimes, humor. 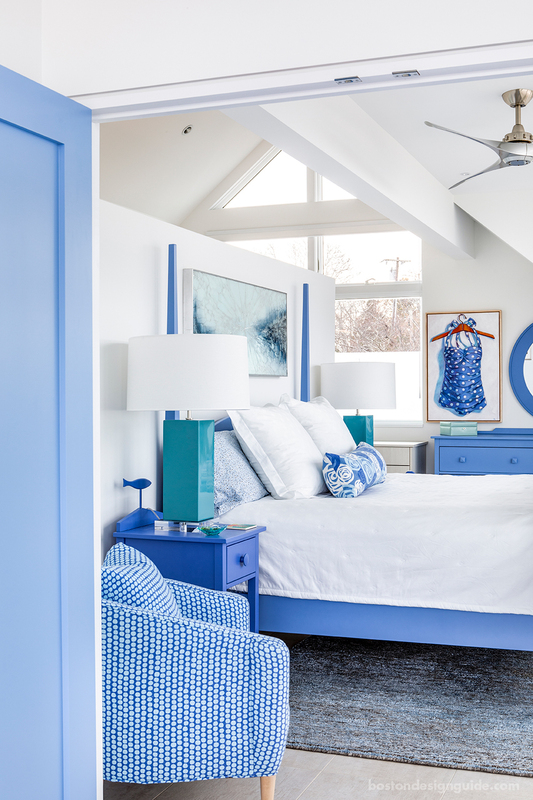 Above, the master bedroom, painted in Ben Moore’s Aqua Marina, boasts a panoramic view of the bay and a massive walk-in closet. Every room gets a view—and a color. The impact of which brought tears to the eyes of Project Manager Bradford Lussier once fully realized. Above, a bedroom in Ben Moore’s Peacock Feathers. The residents had a clear vision for the décor, and the choices were a joint effort. “Everything that Bill and I pick—whether it’s art or the furniture—are things that relax you, and make you smile,” explains Kim. Above, Classic Kitchens & Interiors provided the homeowner’s “dream kitchen” which has a backsplash of Silver Leaf Antique tile that ascends to the ceiling, Woodmode cabinetry, a Wolf pro-hood, Quartz countertops 2.5 inches thick with mitred edges, and veining that continues on the waterfall edge. 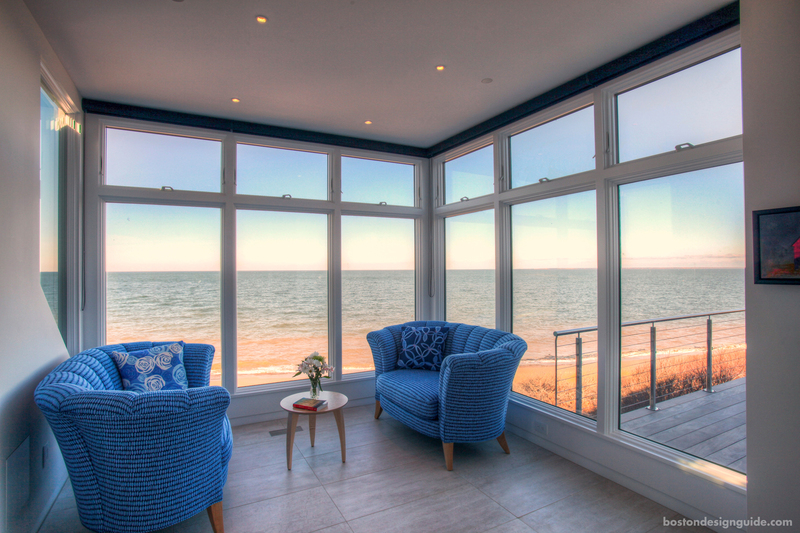 Glass is the material of choice. It graces the cerulean tile of the kitchen backsplash and master shower, the full bayside façade of the exterior, the “tower of light” of the stair hall, and Classic Kitchens & Interiors’ decorative back-painted glass cabinetry, which is revealed in an ultra customized kitchen then carried throughout the home, explains Rebecca Brown, Design Manager and Certified Kitchen Designer of Classic Kitchens & Interiors. The look is fresh and contemporary, but not too precious. The shower and commode doors and surrounds by Cape & Islands Glass are outfitted with sliding barn door hardware. Privacy films were added to the windows and the glass around the toilet. In-floor lighting serves as a nightlight. The Kohler Reve freestanding tub, from Supply New England, is the centerpiece. 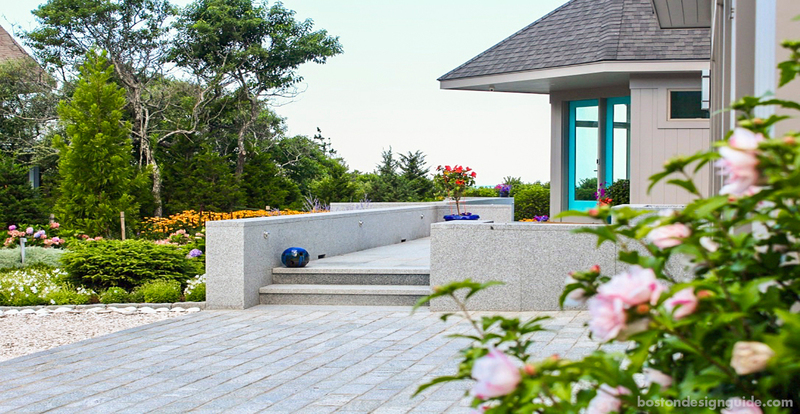 The goal for the landscaping was to “create a house that comes off the dune and out of the beach environment and transitions to a slightly more contemporary setting with a lot of color,” says Ponderosa’s General Manager Peter McKendree. Ponderosa Landscaping struck some middle ground for the approach, creating crushes of color with perennial beds and installing all-granite custom stone elements and a contemporary courtyard illuminated with custom lighting recessed into the stone. 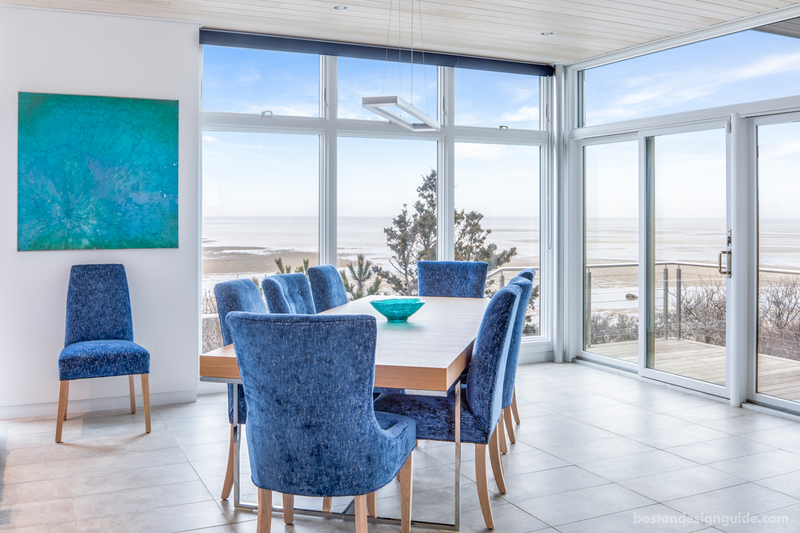 The landscape, together with vibrant turquoise doors, hints at the style that awaits inside and from the shore. From the water, “it’s definitely a house that stands out,” says Kim, clearly amused that they’ve given beachcombers something to smile about. 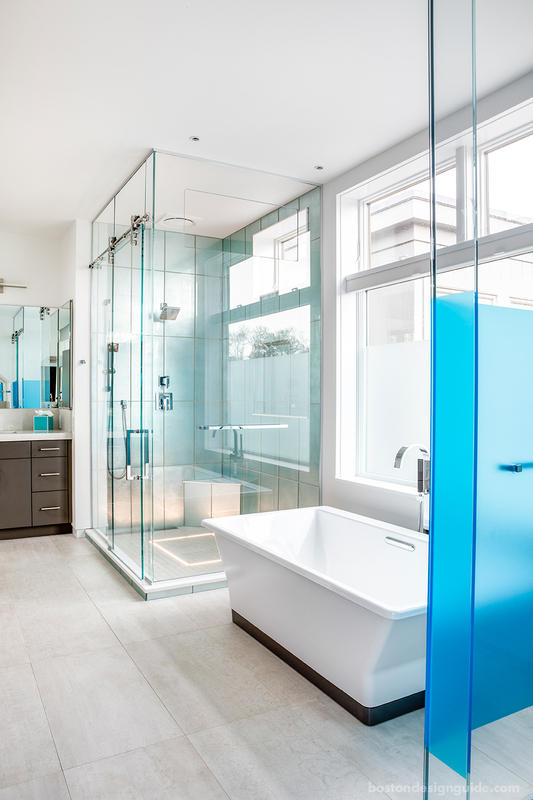 Shower Glass: Cape & Islands Glass, Inc.